Sean Aughey, Amsoil Master Direct Jobber with 26 years experience here. Do feel free to send me your questions, I look forward to hearing from you! 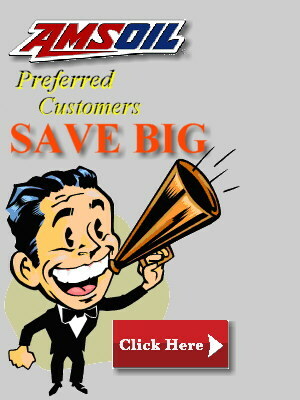 AMSOIL - "Our Company makes the Best Lubricants in the world, period, and challenges anyone or any company to prove us wrong! That won't happen because our competitors know it's true."....... A. J. Amatuzio, President and CEO. ... I've learned more than a thing or two about lubrication and how Amsoil synthetic oil steps up the performance of most anything the the Amsoil oil is used in. Over the years I've seen the results of using Amsoil on my own equipment as well as countless positive results in customers' equipment. I'm going to do my level best to describe as best and as unbiased as I can what you as a vehicle owner can do when you decide what level of performance you should consider or need with your oil. 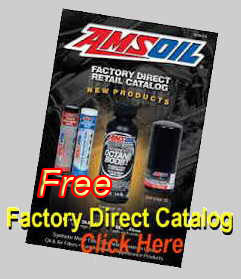 Now as you look around my site, clearly I represent Amsoil, the question of course is why did I choose to do so. 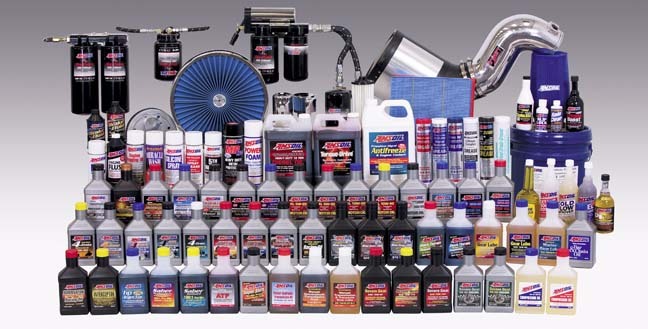 When I first began representing Amsoil I tested my own vehicles and equipment first to see if I could notice any performance difference between the petroleum motor oil, automatic transmission fluid, gear oil	and	grease	I	was	using	before	Amsoil	and	Amsoil oil. In every case I saw a measureable improvement, and in some cases, Amsoil brought stunning results! My early experiences with Amsoil oil are here, "My Experiences with Amsoil" and it is the major jumps in performance I saw in my own equipment that cemented in my mind that Amsoil synthetic oil performance was not hype, the performance claims Amsoil made were truthful, (which continues to this day) and that I would do very well to introduce Amsoil products when I had problem equipment to repair in my work. My background comes from the 'Oil Patch', specifically large natural gas compressors, (think a nice bungalow... yes engines the size of a house) as well as the support equipment needed to operate a production plant, be it a resource company that's capturing oil and natural gas out of the ground or a faciltiy that's purifying the product for sale to industry and the public. I serviced the very big to the small, from natural gas compressors to small equipment such as air compressors of which all operate	continuosly, 24hours a day, 7 days a week. In the Oil Patch I saw numerous companies using normal petroleum oil, not for a second considering that their buying decisions had any impact on how long their equipment might last or how well it might work. I can think of numerous examples where I showed up to diagnose a piece of equipment that was giving the company grief to determine their equipment was operating in a borderline condition, and simply changing up the performance level of their lubricant would completely eliminate their repeating, very costly problems. Amsoil did this for me time and time again. And at other sites I also got the other side; personel that wouldn't listen to the time of day let alone take the time to hear of my experiences with a particular piece of equipment using an oil that wasn't petroleum, I have this to say... "You can't teach stupid." Move on. I got an emergency call to solve a problem this new site was having with their brand new air compressors. 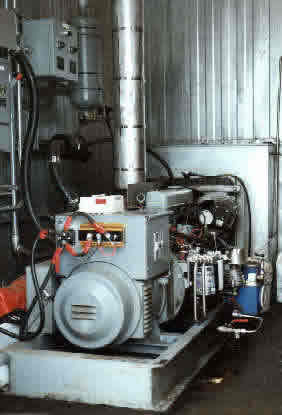 The site air system used 2 identical air compressors, a main unit and a standby in case the other quit running. The problem was this; the first air compressor would go down from the electric driver over-heating, the second air compressor would then kick in but it too would go down before the first air compressor electric motor had enough time to cool and reset. Then thirty minutes later the whole plant would crash from lack of air, result? Zero production from SIX 3612 Caterpillar natural gas compressors!! I measured the electric motor current driving these identical constant run air compressors, 40 amps each, right at the rated maximum. I checked in the compressor room for what compressor fluid they were using, Esso petroleum ISO 100. Thought to self...( If I replace this compressor fluid with Amsoil compressor fluid, I know there'll be a drop in current demand, will it be enough to stop these electric motors from dropping out on over temperature?) This was the easiest and quickest solution to try first, if the electric motors still kicked out, well I'll have to source smaller drive pulleys and belts and drive the air compressors slower which will lower the current demand. Hopefully the lower air output would still enough to satisy the plant air requirements! Guess what, I introduce Amsoil ISO 100 synthetic compressor fluid, (stock # PCK) and the 40 amp draw immediately becomes a 38 amp draw, (I'm onto something...) I know enough to expect this current draw to lower again as the benefits Amsoil compressor fluid brings become more evident as time rolls on. I monitored the current draw... long story short is that within 2 hours, the current demand had settled out at 36 amps and stayed there. Now to change the second air compressor fluid to Amsoil... result, 36 amp draw as well. Both electric motors stopped kicking out on over temperature, problem solved. This 10% current drop is precisely the difference in horsepower consumed to drive identical equipment filled with a fine petroleum compressor fluid and the top dog synthetic, Amsoil compressor fluid of the exact same viscosity, ISO 100. A full 10% drop in current demand was fully the friction difference between these two fluids, nothing else, and in this particular plant's circumstances, stopped them LOOSING 50 Grand an hour! With drop in horsepower consumption like this, a quick calculation shows plants using Amsoil compressor fluid got the fluid for free, the savings in the electricity NOT consumed saved more than the cost of the Amsoil compressor fluid. In the oil patch, in time I would introduce many resource companies to Amsoil products, ALL sites that took me up on my recommendation benefitted. It was always the tough or the critical operation situation where Amsoil would be part of the solution that gave the locations I serviced the highest return on their Amsoil investment. At this particular site in the 'Oil Patch' a small gen-set produced electricity for a small plant. The company didn't want to spend the money at this location to have a backup gen-set so the single unti had to be as reliable as possible. When I happened on this site this gen-set was all BUT reliable. The operators there told me every six months like clockwork the engine would blow-up, usually a crankshaft bottom end shell bearing would seize, burn itself up and that's all she wrote. I checked the battery's store to see what brand of consumables for this gen-set they used, especially the oil filter and oil, found the usual petroleum name brand oil and name brand oil filters. The air filter for the gen-set, they used the same everyday usual paper air filter that a car driving down the road would use. So myself and an electrician tied-in a rental gen-set we'd brought with us and loaded up the remains of the grenaded gen-set to take to town. I would overhaul this gen-set... properly, as if it were to be a racing engine. 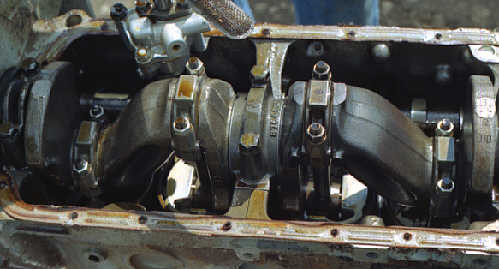 In addition to the normal overhaul an engine that's worn out gets, after I had the destroyed journal on the crankshaft welded back up I had the crank properly aligned, then ground, the block line bored, decked and cylinders bored to fit oversize pistons. The generator was sent out to be re-wired as well as insulation tested, we wanted this gen-set to run reliable, as it never had before, and run reliably for a long time. In place of the usual single full flow oil filter, I installed the Amsoil Dual Remote full flow and bypass oil filter set-up to take care of the oil filtering duties. The engine was run in on petroleum oil for the first 200 hours, then Amsoil 10w-30 Synthetic, (stock number ATM) was introduced to the engine. Every 1000 hours an oil sample was sent out, back came the results... "Amsoil oil good for continued use". And thus began 2 and a half years of weekly preventative maintenance visits to ensure everything about this engine was healthy. The operators at this site got really nervous and started to grumble when I didn't change the Amsoil sythetic out at FOUR TIMES the maximum recommended 1000 hour oil change interval. The oil analysis reports all the while kept saying, "Amsoil oil good for continued use" and I further complimented oil analysis with on site 8 micron patch testing to visuallly verify under the microscope oil cleanliness so I was comfortable with what the oil analysis results were showing. I agreed to drain out the Amsoil that the lab that does research and development work for ESSO said was fine for continued use in the mid 5250 to 5500 hour interval. These fellows were really concerned and felt a sigh of relief when there was new oil in this little engine. None of them had ever seen an oil last this long and couldn't and didn't believe the reports. I have to say, there was a paradigm shift going on with this engine! Things that normally wore out continued to wear out. The sparkplugs would be worn out, the sparkplug wires I would replaced with new ones, the old wires would no longer supple, bump them and they'd snap the insulation! New distributor caps and rotors, new water pump v-belts, multiple valve clearance inspections (but no need to adjust any valves), but not an Amsoil synthetic oil change. In the beginning of our 2 year run, a heat gun test showed maximum Amsoil Bypass Oil Filter life to be 1500 hours, the Amsoil bypass and Amsoil full flow filters would be changed, the oil lost topped up and on we went. Then I decided to replace the standard paper air filter with an Amsoil foam air filter Amsoil made then. This Amsoil air filter made a huge difference to the bypass oil filter life, the bypass filter now lasted and lasted so I changed the Amsoil oil, Amsoil full flow and Amsoil Bypass oil filter together, at the same time, between 5250 to 5500 hour intervals. At 12,000 hours while the rest of the plant was down for a week for turn around, (rebuild and repair what needs to be fixed) operations wanted the engine overhauled. "WHAT! Oil analysis says there'll be practically no wear, a compression test shows only the #2 cylinder is down on compression 11%. Make you a deal, I'll remove the head, take it to town and have a 3rd party engine shop look at the head, if the head is toast, then we'll rebuild the engine, if the head only needs a quick seat grind and the rest of the head is fine, like I think it is, we'll not touch the rest of the engine... deal?" I even bring out "under the microscope" visual inspection that confirmations exceptionally clean oil, ( the 8 micron patch test gear I have ) and it's only showing operations this exceptionally clean oil that aleviates their fear of engine failure and so on the engine will run. Management agrees as well. So what does the shop say when they inspect this 12,000 hour head? "All the parts here are fine, no need to replace any parts, I'll reuse everything except the valve seals, I'll have this back together for you in an hour. All I have to do to it is give the exhaust valves and seats a quick grind." On goes the head in the same day and it and the rest of the engine then continue to run for another 7000 plus hours of totally reliable continuous 24 hours a day, 7 days a week operation before management as well as operations again get really nervous about this little engine. They'd expected it to blow up any day now for the last year and a half and now after 2 and a half years of continuous 24/7 operation, they can't take the suspense any more! This is the #3 rod cap and bearing. 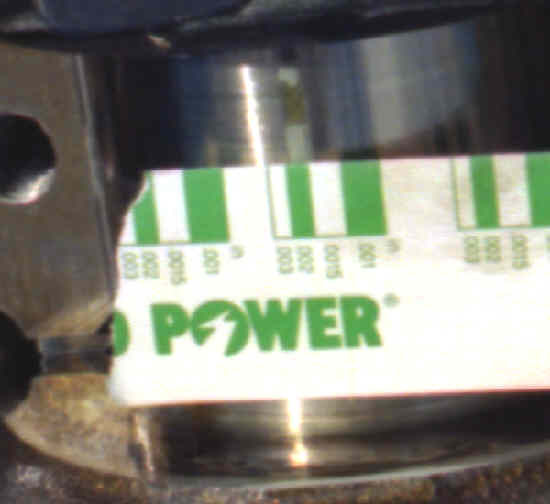 I plastigaged this cap so the plastigage evidence is seen just over and to the left of the oil hole. A half a thou wear in 19,000 hours?! 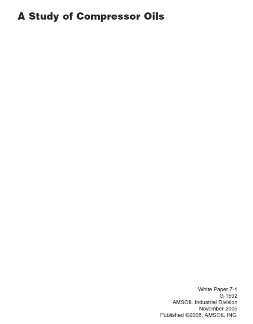 This is the center journal of a three bearing crankshaft. This is not a strongly built engine, there should be 5 journals. Even so, check-out the closeup picture below. The plastigage indicates a clearance of about 1 and 3/4 thousands of an inch, as in 0.0017~0.0018"
I build this engine with a new fitted clearance of 0.001" and after 19,000 plus hours there isn't even a thousanths of an inch wear?! What cross-hatch after 19000 plus hours?! 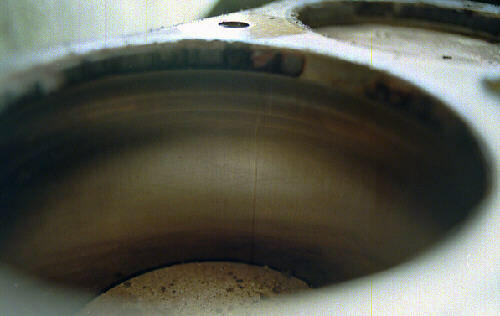 Piston ring end-gaps had almost no change! Biggest increase was the top ring end-gap, went from new fitted gap of 0.003" to 0.005". The vertical line on the cylinder lines up with the top ring end-gap, it is not a scratch, nothing could be felt across this line with a finger nail. 19,000 plus hrs. 0.005" 0.002" 0.0015"
The rocker area of the head is spotlessly clean after 19,000 plus hours! There is not a single deposit anywhere. This bottom end would something to be proud of with any engine, it's spotlessly clean. I submit that this example is exceptional, 19,000 plus hours! 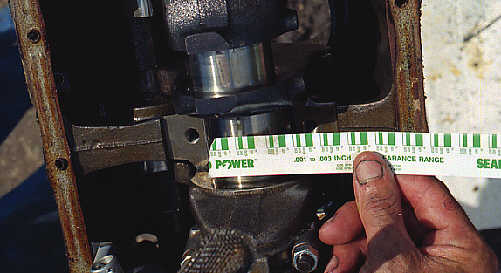 The cam follower area is a prime spot for a lesser oil to allow build up of oil related deposits. Not here, it's spotlessly clean. You're looking at cork material. Seems more care has to be taken to ensure rocker cover gasket material doesn't fall into the engine at the numerous valve clearance inspections with NO adjustments! Obviously I'm kidding, 19,000 plus hours with 4,000 to 5,500 hour oil drain intervals? This is clean. So, just what do you say to a mechanic who asks, "Why are we taking this engine apart? It's like new." I told him the truth, "Because the engine has over 19,000 hours on it"
"Bull**** it has!!" says the mechanic. I say, "There's the daily log book over there, there's 2 and a half years of daily entries in it, look at this log..., and to verify the logbook is for real, there's the lead operator over there, go ask him." And the mechanic DOES look at the log, and the mechanic DOES ask the lead operator, and the mechanic returns looking VERY disturbed. He says, "If this gets out, we mechanics are out of a job! This kind of engine I never see lasting longer than 4,500 hours!!" I say, "You know, you don't have to worry, I'm the one that was the king-pin in getting this company to go for Amsoil synthetic oil, Amsoil oil filtration and Amsoil air filtration, oil analysis and I'm the one that's battled to NOT have them take this engine apart until now. Even with the results right in front of them, human failings will have this company go right back to putting in regular petroleum oil, regular oil filters and regular air filters as soon as I leave this project, even though the cost to operate this gen-set has been way less than half what it would cost using regular petroleum oil and normal oil and air filters." When I left for other pastures, others took care of this little engine installing regular petroleum oil, standard off the shelf oil and air filters and that little engine blew-up just like clockwork every 6 months... costing the company tons in lost production, ($6,000 per hour) in unexpected lost production. This little gen-set is an excellent example of exceptional service from what is really a cheap engine when extra steps are taken to promote its longevity. The Amsoil air filter stopped the dirt laded air with its wear causing particulate before it could enter the engine, the Amsoil bypass oil filter pulled out the very fine wear causing particulate within the engine, the Amsoil full flow oil filter easily lasted 5000 hour service intervals to catch anything big the first time it tried to circulate into the engine, the Amsoil oil filter didn't degrade and fall apart as a standard oil filter designed for 3 months and 3000 miles, (that's about 75 hours!) 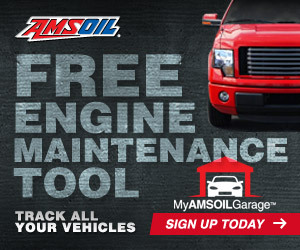 would do, and since the Amsoil synthetic oil was kept spotlessly clean, the long lasting capabilities of the Amsoil synthetic oil made its presence known as evidenced by the oil analysis results. The evidence of the lack of wear going on in this engine I saw in real time right under my microscope with my own eyes, the third party mechanic and myself verified this lack of wear with plastigauge and pictures of the evidence to prove Amsoil synthetic oil and Amsoil oil and air filtration products deliver a superior performance with exceedingly long life to overhaul, in this case of a little 4 cylinder 1600cc engine that HAD to run. The results above are but some of the evidence I accumulated in a decade in the Oil Patch that supported superior performance at lower cost of ownership than standard oil and filtration products and it is this evidence that I collected myself that represents WHY I heartily endorse Amsoil synthetic oils, Amsoi filtration products and WHY I represent Amsoil. Amsoil from 1972 has delivered a stellar lubrication product line with the highest level of performance, from wear prevention to fuel mileage savings in a product of vastly longer drain capabilities. 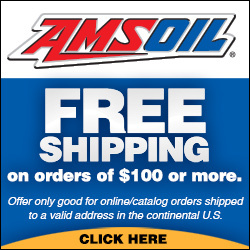 Amsoil is proven to be the best oil available on the market by independent laboratory comparison tests and did exceptionally fine in my tests too. What this means for you is unheard of convenience, the greatest fuel economy changine oil can do for your vehicle and piece of mind knowing the very best lubrication technology is protecting your vehicle beyond other synthetic oils and well beyond petroleum oil. Do you think that oil is oil so who cares what I use? Do you buy the cheapest oil you can thinking you're saving money? Like anything of quality, the benefits quality brings are why Amsoil is well worth your consideration. 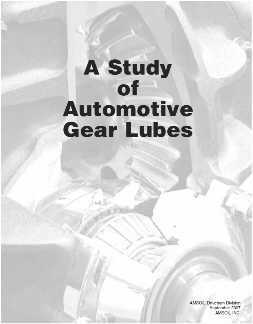 Amsoil has for decades compared the performance of their lubricants against the competition by hiring independent labs to performance test oil that the labratory buys off the store shelf. Other oil companies don't publish their oil performance comparing theirs to the competition, why is that? Grease Pound-Out is always an Issue - or is it? oils (sometimes) embarrasing performance results. There is a W I D E range of lubrication performance between great and regular commodity grade oil. Advertising hype is everywhere with everyone claiming to have the best oil there is. This is very confusing on the surface, but you can determine very quickly if your oil of choice is a premium product or like 95% of the rest of the market, a commodity grade product no better than every other commodity grade product. their products' performance to their competition? "some lubricants sold in North America could actually be hazardous to engines..."
"Lubes' n' Greases" Automotive Editor David McFall, once with the American Petroleum Institute tackled the issue of extended drain intervals in his March 2003 column, criticizing the standard 3,000-mile oil change and referring to the American motor oil market as "shackled." Amsoil, the Company of Firsts is the largest independent synthetic oil manufacturer in the world and has a documented history of innovation and leadership.